A synthetic peptide (conjugated with KLH) corresponding to the C-terminal of mouse 14-3-3 beta / alpha. In TBS (pH7.4), 0.5% BSA, 25% Glycerol and 0.05% Sodium Azide. 14-3-3 proteins are a family of conserved regulatory molecules expressed in all eukaryotic cells. They have the ability to bind a multitude of functionally diverse signaling proteins, including kinases, phosphatases, and transmembrane receptors. 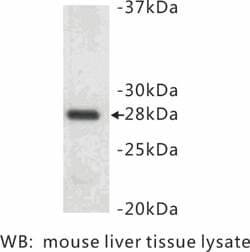 More than 100 signaling proteins have been reported as 14-3-3 ligands, 14-3-3 b/a is one of them. They play important roles in a wide range of vital regulatory processes, such as mitogenic signal transduction, apoptotic cell death, and cell cycle control. Elevated amounts of 14-3-3 proteins are found in the cerebrospinal fluid of patients with Creutzfeldt-Jakob disease. By similarity. Interacts with SSH1 and TORC2/CRTC2. Interacts with ABL1; the interaction results in cytoplasmic location of ABL1 and inhibition of cABL-mediated apoptosis. Interacts with ROR2 (dimer); the interaction results in phosphorylation of YWHAB on tyrosine residues. Interacts with GAB2 and YAP1 (phosphorylated form). Interacts with the phosphorylated (by AKT1) form of SRPK2. Interacts with PKA-phosphorylated AANAT. 1. Takahashi H, Iwata T, Kitagawa Y et al. (November 1999). "Increased levels of epsilon and gamma isoforms of 14-3-3 proteins in cerebrospinal fluid in patients with Creutzfeldt-Jakob disease". Clin. Diagn. Lab. Immunol. 6 (6): 983-5.